shirls gardenwatch: Back to the borders – frost forecasted! This morning I finally managed to get back out into my garden. Although still very windy it was quite pleasant, no rain and the sun even broke through for a brief while. There have been a few jobs I have wanted to do, and it is not unheard of for me to garden in the rain, but the winds have made it very unpleasant to be out. I was very pleased with what I achieved today. I particularly enjoyed the pruning! Wisteria, shown above, received the first cuts from my secateurs today. Pruning, I find, quite a satisfying job. Although I am known on occasions to get a tad too zealous! Today’s job on the wisteria is the last before it flowers. I have only been successful with flowers in the last two years. Ironically after trying many methods of pruning, my plant of 8/9 years, flowered after I was brutal with it! I decided if it couldn’t yield flowers than it could yield a better shape – I pruned it hard back to main stems, cutting away branches that spoilt it. I never considered taking it out as I love the dripping form of the leaves hanging over my pergola. I was also ever hopeful every year in the spring when I inspected the new growth believing this year … it could flower. I now prune my wisteria three times. First cut is in the summer taking out the extremely long whippy new growth – it makes it look better too. Second cut is in late autumn pruning back to four pairs of buds. Today I cut back to two pairs of buds - I usually do this in January- early February depending on the temperatures. If I am lucky again this year with flowers I must better take care of them – they looked very weak and dried out last year. That should have told me the problem – too dry! I have since read in a magazine or heard on TV that when in flower a wisteria should be well watered. I’ll try that this year. I should have beautiful, white scented flowers so here’s hoping…. 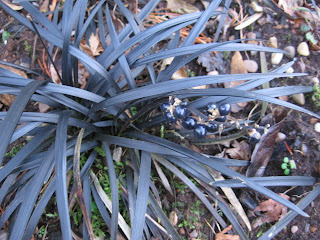 I am also hoping that this year I will significantly increase my stock of the black grass - Ophiopogon planiscapus 'Nigrescens'. Today I pulled off its berries, shown in photo above, and pushed them into the soil– spacing them around the parent plants. I do enjoy this expectation of new plants – successful or not. This plant can also be propagated by division from a larger clump but I am not always succesful with this method but it is definitely worth a try. I have to say though I did feel a tad uncomfortable planting the berries today – they looked too much like the eggs of the New Zealand Flatworm!! I usually put these eggs in a jar of salted water – as worms they digest earthworms and each egg can produce up to seven worms. We must destroy them to stop them spreading. I managed to tidy and weed two other borders today, pruning again as necessary. I weed by hand with a small fork and I always like the look of the soil after being forked over – the border looks tended and cared for. I still have more areas to do. I also had some extremely late bulb planting to do – I forgot about my tulip bulbs! The tulips are ‘Uncle Tom’ and are said to be unique in colour which is a glowing deep maroon red. They have already started to shoot new growth so I planted them two in a pot and if they come up okay I will then plant them out in the borders. 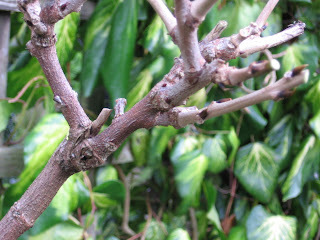 The photograph of my pruned Wisteria was taken on January 15th 2007.